Rhiannon's Sugar Rush » NewTribeZ.net - Empowering you! Slogan: Made especially for you! I provide great home styled sweet items including gluten free items. With a huge product range that includes Birthday cakes, Biscuits, Baby cakes, Muffins, Breads, Cupcakes and Specialty cakes, I believe we have a treat to suit almost anyone’s tastes. My products are available from the St Helens Market most Saturdays and I can provide specialty orders. 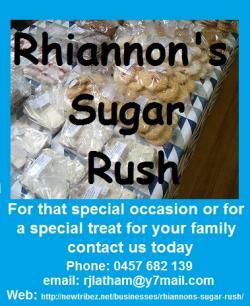 Rhiannon's Sugar Rush products are available from the St Helens Market (Portland Hall) most Saturdays. Specialty services include the supply of Birthday, Christmas and Novelty cakes. Contact me for that special event, no job too small. I am also availed for bulk café cake and biscuit production runs. If you having trouble keeping pace with business or wish to focus on customer care knowing that the cakes and biscuits are going to get you great reviews then contact me and lets work together to enhance your operation. Please note quantity discounts apply. I want to make your cake shopping experience as enjoyable and simple as possible so contact me today and let use would together to make your next event the success it should be. Please note that I bake to order so please place your order at least on week prior to delivery to avoid disappointment. I can deliver in the local St Helens area.